Design - From Concept to Finished Product! Howdy guys and gals of the Internet. This weeks blog is going to be a special one, in which I give you all a look into my design process for Millennium Exile. So…I’m about to show you some REAL embarrassing artwork of mine, but there is a point to it. Throughout my personal design process, it’s important to remember that not every idea has to be perfect or look great. Patience is a virtue, and there will be plenty of time for polish later on. When creating a character, I’ll start by considering a few things first….such as, “Who” my character is, “What is his / her role, “When” will the character be appearing and “Where” the character comes from and currently resides. By answering these questions, I’m left with a better idea as to “Why” my character needs to exist. This will help me with my design process such as personality, clothing, race and abilities (if any). After I’ve stroked my beard in a thoughtful manner-, pondering the bigger questions; it’s time to do some really bad drawing. Let’s use the Pantheon Armour Genesis as an example. Firstly, I’ll gather some resources and inspiration. I’ll go out and grab a bunch of random mecha designs to help give me a good idea of the various shapes, that hold together the greater design. The Laevatein from “Full Metal Panic”. 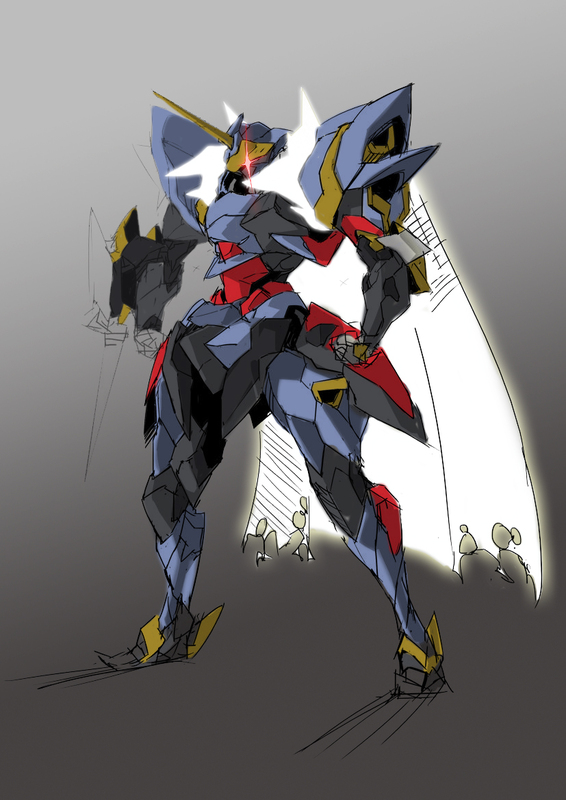 I’d previously decided that the genesis was going to have a Knight- type design, so I was sure to grab a few Anime-esk knight images to help me get an idea of armor shapes. It’s time to start doing those embarrassing drawing I was telling you about…. I’ll save you the many, many botched sketches that came before this; but needless to say, it’s extremely important to stay loose with your design ideas. This stage is a form of brainstorming of sorts, so keeping those ideas free-form prevents you from spending too much time on an idea that might not work out. Silhouetting is another great way that many artists go about the design process…this is another way of making sure that the form of something works out before getting into all the detail. After roughing out a few ideas, I chose the one that I felt worked the best. As you can see below, I’m keeping the shapes SUPER basic and leaving notes for myself. These notes are to help me remember my thoughts throughout the design process. Sure, I might know NOW what I was thinking when I drew that “thing”, but should this design take days, weeks or months….it’s important that I leave these breadcrumbs for myself along the way. I also started adding some basic colors to my design. Because the Genesis is going to have a Knight motif, I went with the “Hero’s Palette”, focusing primarily on greys. The “Hero Palette” predominately consists of Red, Blue and Yellow, using White as the base. I call it the Hero Palette, because if you think to most main character mecha’s, they all sport this particular combination of colors. For example: Code Geass’s “Lancelot”, The Escaflowne, Broken Blade’s “Delphine “, or even almost every main characters initial Gundam to name a few. All these mainly use whites and greys as their main base color often containing accents from the other colors. Obviously there are the exceptions, such as Evangelion or Gurren Lagann…but for the purpose of the Genesis, I went with the stereotypical hero’s color scheme. Now; at this point, most people would continue with the design process through redrawing the basic design, adding more details as they go. However, as I have talented artists drawing for me, it’s important that I know when’s a good time to hand it off. As I’m the project creator, I’m also in charge of a multitude of other things, such as designs, writing the story, managing the project’s social media platforms and marketing. Because of this, I try not to get too “bogged down” doing everything myself. I’m an okay artist, but I’m not the best…..that’s why I hire other artists to help. Think of any Hollywood movie, none of that is made by just one person. Sure, the idea, might have come from a single mind…but that idea is then refined -re-refined and re-re-re-refined dozens of times with the help of other creative influences. A single movie production has directors, story-boarders, scripts writers, actors, a special effects team, stunt doubles, prop teams and composers, just to name a few. Sure Millennium Exile isn’t some big Hollywood production, but the exact same rules apply none the less. So off we go to Hary…. 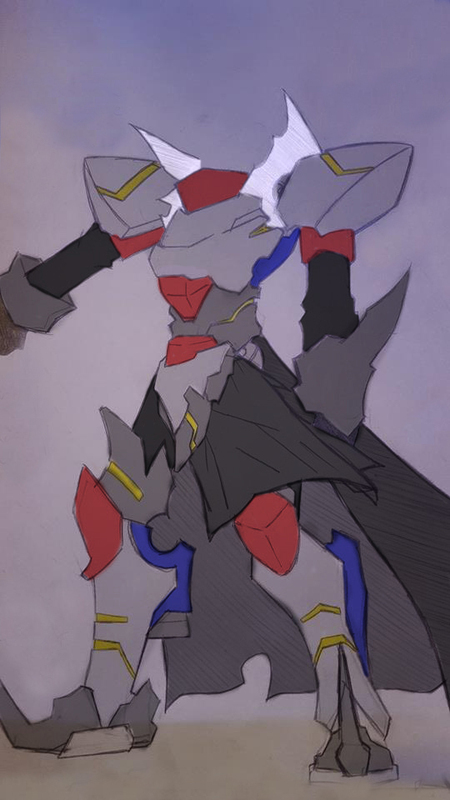 Hary (being the mecha god that he is), then takes my rough design and knocks out a quick sketch along with some head ideas (as my current design had no head and I really needed some extra help with it). In this instance, I felt that the head was way too small for the body, so I took that sketch and started playing with some of the proportions. Hary takes the revision and draws up another sketch, this time using cleaner lines and some basic shadows. I then take that, draw over it a little more and add my color palette to it to get one last overall look and feel of the current design. After Hary and I have a final chat about the design it’s off to the races! Hary works his magic and eventually comes back to me with his finished product. During our conversations, we also decided to add Vincent standing atop the Genesis to give us some perspective that this is a pilot driven machine and not a suit of armor. I take Hary’s final work and add some finishing touches to it…. This can sometimes be touch-ups and re-colors of certain areas, adding special effects and glows. In this case, I added some vibrancy to the color, drew in an eye to make it appear more active, changed the gem in the horn to green, added some particle effects to the shoulder pads, and boosted the whites of the cape to give it more of an “energy” effect. After a few minutes spent in Photoshop, VOILA! The final product that I put out to the world…Ladies and gentlemen, The Pantheon Armour Genesis. Well, this week was another big one…. I recently uploaded the Millennium Exile Demo Reel 2018 cut to the Internet. I debut it at the Oz Comic-Con convention last week, and I thought it would be a nice little “Thank You” to my Patrons. That’s right I’m sorry, but the Demo Reel is only available to Patrons who currently reside in Tiers 2 and above. The special Patreon piece is still underway also. Note: As the image is currently entering into the final stages before completion, this will be the LAST preview of the WIP regarding this piece. Some assets in the below image are placeholders and not necessarily representative of the final product, however the completed image is going to knock your socks off! A special thanks to Australian Anime and Manga store “Zombster” for requesting that I provide them with more material about the project. They already display my cards, which provide people with all the links to the official website and social media platforms. 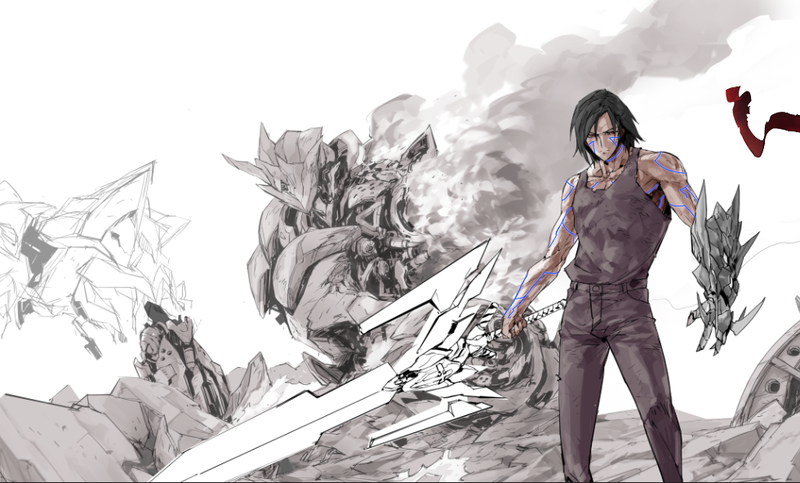 Lastly, but certainly not least…..IQ40’s newest Demo Reel artwork is progressing at an insane rate!